WE ARE A REAL WORKING MUSEUM .... A PLACE WHERE COOL THINGS HAPPEN .... BESIDES OUR MOTORCYCLE WORLD YOU WILL SEE MANY OTHER THINGS SUCH AS CANNONS .... VERY .... VERY OLD THINGS .... WORLD WAR TWO THINGS AND LOTS OF OFF THE WALL STUFF .... PLAN ON SPENDING AS MUCH TIME AS YOU CAN .... SO MUCH TO SEE!!!!!!!!!!!!!!!!!!! By just walking into Cycle-Moore, you're witnessing a life time accumulation of Steven and Shirley Moore's and their kids motorcycle history. Our walls are crammed with collectibles and pictures from days-gone-by, as well as vintage bikes of all kinds. Plus parts and displays. Our museum is here for you to enjoy at no cost. It is always changing, so check it out often and stay long so you do not miss anything. SOME TIME IN THE NEAR FUTURE WE ARE PLANNING ON FEATURING A DIFFERENT BIKE EVERY MONTH ON THIS PAGE ...... KEEP WATCH FOR IT ..... THERE ARE SOME PHOTOS OF EVENTS AND BIKES IN THE PHOTO GALLERY. Always a work in progress, the Cycle-Moore Motorcycle Museum changes often ..... bring your camera .... pictures allowed .... populated with vintage examples of the early years of two-wheeled transportation .... some you may of never heard of. 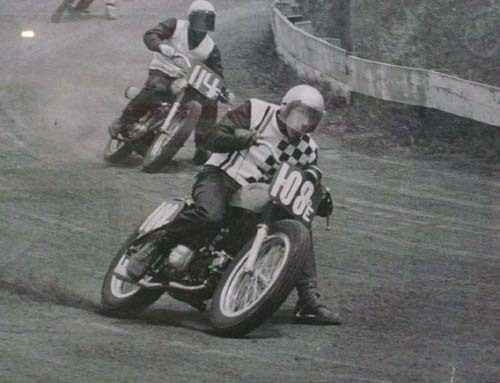 Currently featuring several early Harleys, BSA's, Vickers, Famous James, an Allstate, a Cushlman Eagle, a Lilac, a Jawa Stadian, Huskys ridden by A Natiional Enduro rider, Dr. Hoyt. These are just a few of the bikes on display. Plus there is lots of memoribila on display. Come on out .... grab a cup of coffee and hang out as long as you like !!!!!!!!!!!!!!!!! In addition to the rolling stock, the museum is a virtual treasure trove of vintage gas tanks, pictures, advertisements, posters, and memorabilia. One could spend hours looking over every inch of the attraction and not see everything. 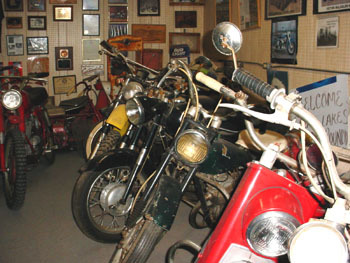 Plan a visit to the Cycle-Moore Antique Motorcycle Museum today!